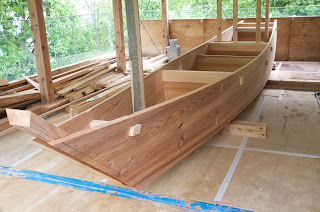 Today was the day to fasten the bulkheads and fit and install the beams. Mostly I followed Murakami san's methods with a few deviations. 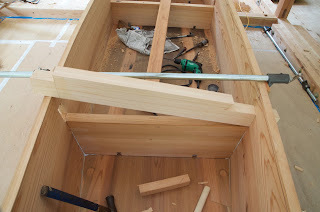 First thing today I nailed the bulkheads through the side planking with long, small-headed nails (the same type used to edge-fasten the planks). 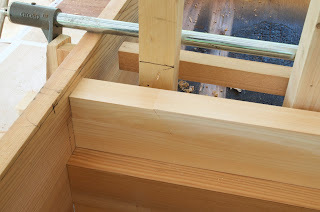 Then I began installing the beams in the mortises. I start by sliding the beam in (from right to left in this photo). The shouldered tenon is clearly visible on the right, note the angled cutout on the left. 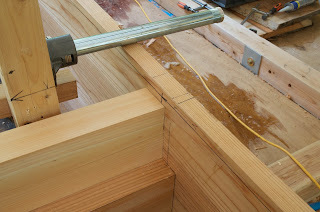 This required me to relieve the top of the mortise on the left side, slightly, so the end of the beam can be lifted. 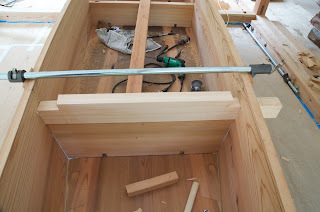 Once the beam is inserted far enough I can drop the right side down inside the boat. 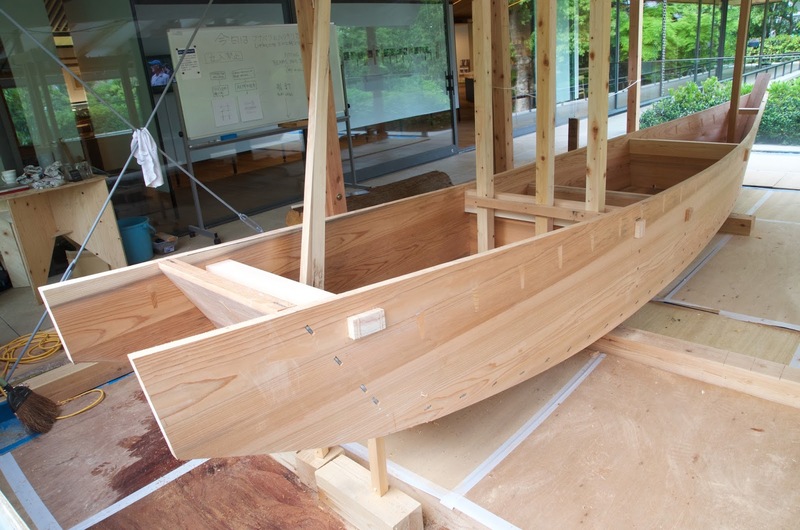 Then I drive the beam back through the mortise on the right until the shoulder fetches up against the inside of the hull. 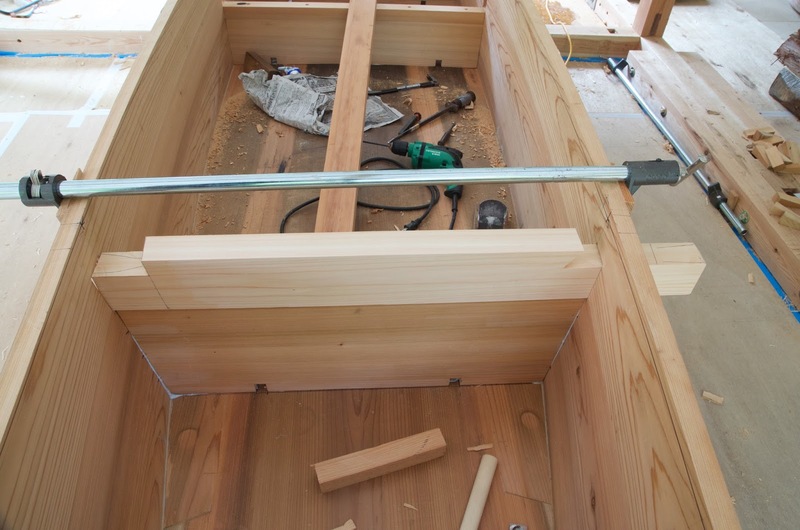 I use the cutout from the left side, carefully cutting it to length to fit inside the boat, and insert it in the beam. It was a tight fit which required I drive it with a hammer. The other side is shouldered tight to the planking. 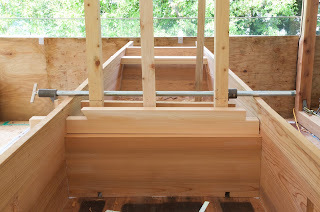 And the cutout is glued in place on the left side, locking the beam in. Murakami leaves a little sliver of wood on the left side of the cutout which fits in the angled slot cut earlier, further locking the whole thing in place, but he has to swing the cutout into the space and can't get a fit to the planking as tight as this. 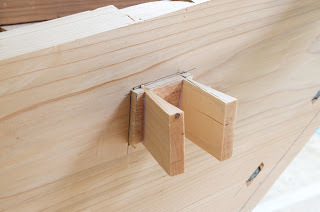 I figure the glue will hold the piece from moving so I opted for the tighter fitting joint. The forward beam goes in the same way, but from the opposite side. This is how Murakami san does it. 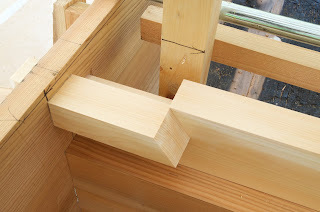 Then I had to cut hinoki wedges for the through tenons. 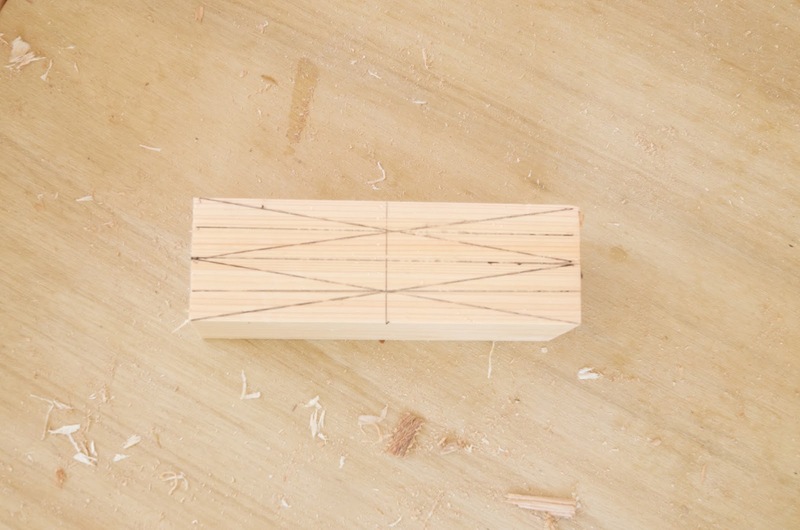 I used the museum's workshop's bandsaw. I have written about Mr. Shoichi Nagatsu, a saw sharpener in Kyoto. I used his custom-made saw to cut off my tenons. 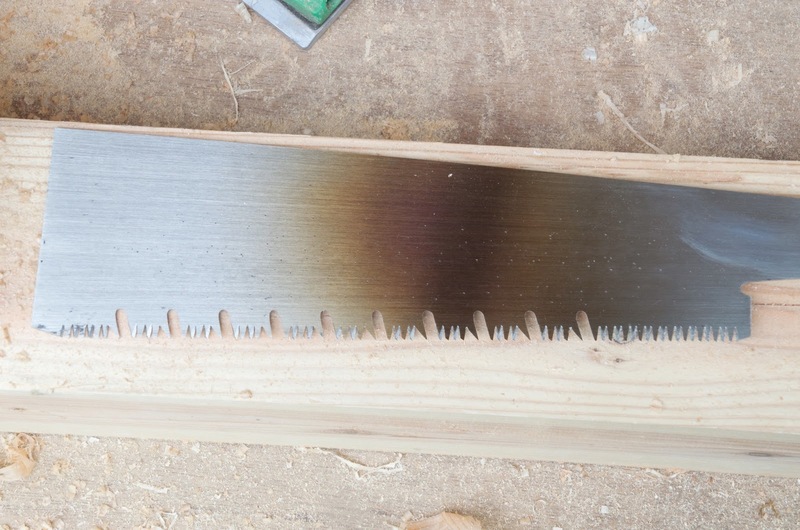 He cuts these gullets in a specially designed Japanese saw. The uninterrupted teeth to the right are for starting the cut. ...and cut flush. Hard to see here but a cut with Nagagatsu's saw leaves a surface so smooth it almost feels planed. 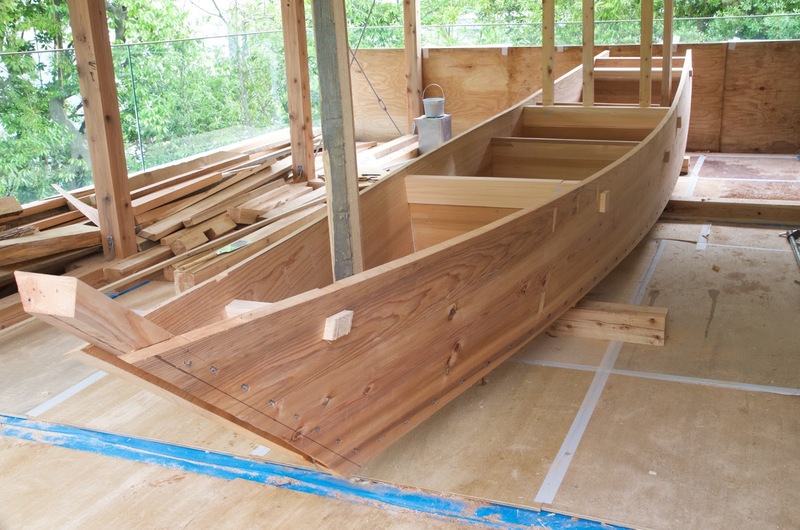 View of boat with bulkheads and beams installed. 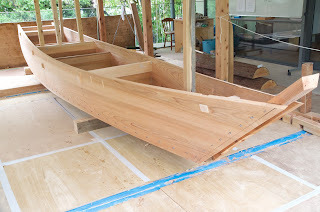 I have my two days off now. 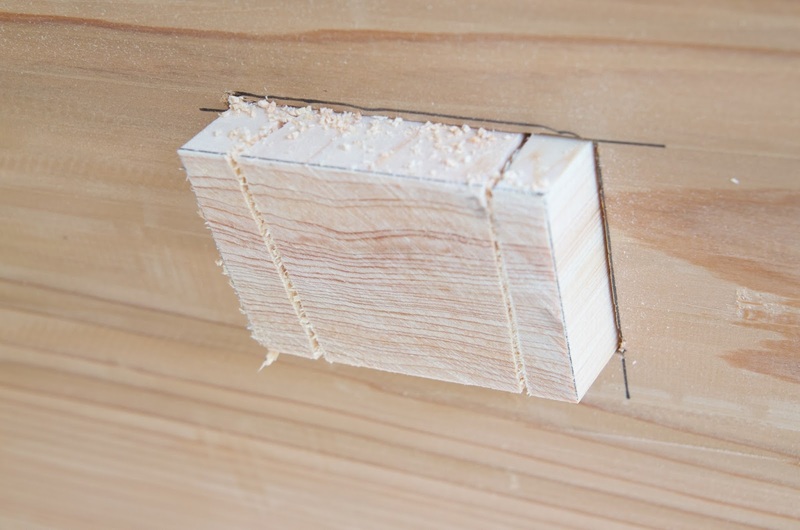 When I come back Tuesday I will remove the props. I also trimmed the planks aft of the transom.